Most amateur golfers struggle with flipping the club or their left wrist breaking down at golf impact. What they don't realize, and I see this all the time, is that a lot of it has to deal with the very powerful left thumb and pushing against the shaft in order to try and get the golf club to release and try to get some speed out of it. What this does is it actually creates a lot of problems that it actually causes the wrist to start to work in the opposite direction and start to add loft to the club face and you start to cast it. It actually costs you clubhead speed. So, in an effort to produce speed by feeling something very powerful by pushing against the shaft with the left thumb in the golf swing, you actually create this throwout motion where the club starts releasing early and then you get this flippy look at impact. Not only that, it actually can cause a lot of golf thumb pain and some ligament and tendon issues. If you have a really sore left thumb and you see the top of your grip is really worn and you tend to wear out gloves right underneath the thumb, this first joint here, you need to start to look at that because not only can you create a lot of long-term injury to your thumb, but you're destroying what's happening in your golf swing. So, one of the things that I do a lot with my students is I have them go to the top and actually start to take their thumb off of the shaft. You can actually kind of just put it to the side. You'll lose a little bit of control of the golf club, but you'll start to realize how much you're pushing against the shaft. This is what you tend to do. So, what you really want to focus on is gripping the golf club with the last three fingers and then as you go to the top, you want to start to pull down with those last three fingers, so that that is creating that nice bowed, flat left wrist at golf impact. Now, if I do the opposite, I start to push against the shaft, you can see how my knuckles start to get out ahead of this wrist bone instead of dragging behind this wrist bone because I'm not pulling with the club, or pulling with the left hand, I'm pushing against the shaft with the left thumb. So, if you struggle with flipping it, you've tried every single drill out there and you can't stop flipping it and your thumb's really bothering you, your grips are wearing out and your gloves are wearing out underneath the thumb, take the thumb off and stop pushing against the shaft. You'll be able to get into a good impact position. 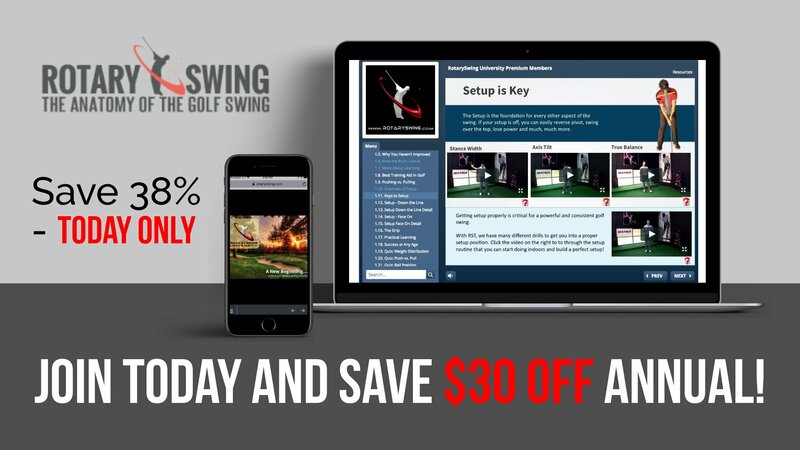 Get Your Free Membership to Finish Watching "Golf Left Thumb: Fix Pain, Soreness, Casting" Right Now!